Episode 340 - Is There Value In Fitness Challenges? I used to hate fitness challenges – 30 Days of Plank, the 12 Days of Lunges, The Burpee Challenge, you know, the ones that periodically show up on your facebook or instagram feed or an over exuberant friend tells you about how they’re doing it and it’s amazing and you should do it too. Yes, I find those people just as irritating as you do, but something has come up that is making me rethink how I feel about fitness challenges, which I will get to, but first I’ll talk about the reasons I don’t like them, because they still hold true. Most fitness challenges set unrealistic performance goals, in the plank challenge for example, if you were to follow the routine exactly, you would go from doing a 30 second plank on day one to a 5 minute plank, or something ridiculous like that in the span of 30 days. This is unrealistic for most people and to top it off if you think Susie in the office beside you can do it, but you’re unable to keep pace that can be incredibly demotivating, which will nudge you to stop or worse push you to continue which only increases your chance of becoming injured and is the next reason I hate, that’s too harsh, strongly dislike fitness challenges. Also there is no need to hold a plank for 5 minutes, do 200 Lunges or 1000 burpees. Let’s change these exercises up a bit, so that it’s still possible for you to move the next day. During this challenge what happens if you miss a day, does that mean you’re out and you have to stop? I know most of our clients probably would, I hear things like this a lot ‘I missed a day, oh well I guess I’ll start again next week’ It’s fine to say that on a Saturday night, but won’t fly with me on a Monday. I think those are basically the reasons I strongly dislike fitness challenges. Being critical about almost everything, those are the aspects of fitness challenges that I always chose to focus on, at least until I watched this 100 push-ups a day challenge that some kids over at BuzzFeedBlue did. It was interesting for me, because my initial reaction was this is stupid, obviously it’s going to be hard, of course they will get better at push-ups and 100 push-ups a day is far too many, but I still watched it to see what would happen, sometimes even I’m not immune to clickbait. In this challenge, the 2 dudes featured in it, have almost no exercise experience or at least very little push-up experience, based on their horrific, that’s too harsh, their not very good form, okay one of them had pretty good form, but it could still be better. Either way they committed to the challenge and followed through on it, which I have to respect. I have a link to the video in the show notes, if you want to watch it, but I will explain the arc it follows here. For the first part of the challenge they are dejected, one of the guys can’t do all of his 100 push-ups the first day, he only makes it to 85, they both said it was harder than they thought it would be and they had to break the push-ups, up throughout the day. They both said day 2 felt harder to them, which makes sense, since they pushed their muscles to maximum fatigue and had no time to recover, but as the month progresses they slowly start to get stronger and better at push-ups with some days being more challenging than others and by the time they got to the end of the month, they were able to consistently do them, the guy with the kind of good form got up to 29 push-ups in a row from 17, the guy with pretty bad form went from low 40 something to low 30 something, which on the surface looks like a slide, but his form got better, not perfect, but better which I would consider a win for him. From a physical standpoint I would say nothing outside of the ordinary, overly remarkable or unexpected happened. Both of them had very slightly more muscular bodies. What surprised me was everything else, during the challenge, one of the guys said he just randomly started making healthier food choices and lost some weight. He noticed a physical difference in his body and then said he felt inspired, like he could do a spin class, or go climbing, which was different than he expected to feel and never felt like those were activities he would have chosen to do at the beginning of the challenge. He also felt like he was carrying himself with more confidence and that he would continue to do the push-ups and look for other ways to be active. This is when I realized I’ve been looking at fitness challenges all wrong. Instead of focusing on all the negative aspects of a fitness challenge I need to look at all the positive things it brings. If you’re someone that has never exercised before, fitness challenges can be really simple and straightforward, you know exactly what you need to do and all that’s left is doing it. Of course it will be hard at first, otherwise it wouldn’t be a challenge, but in conquering the challenge it can give you some motivation to continue, show you you’re capable of doing more than you realize and let’s you experience the impact even just a small amount of exercise can make in how you feel and you carry yourself. 100 push-ups seems like a lot and it is a lot of push-ups, but it’s really only 10 minutes of exercise, spread periodically through your day, 10 minutes. Most people probably spend 10 minutes a day waiting for computer files to download, staying on hold or wasting time that 3 minutes before they go into a meeting, I mean you probably can’t get any meaningful work done in 3 minutes, but I bet you could do a set of push-ups, you just have to decide that’s something you’re going to try, and see what happens. Now 100 push-ups a day is a lot, as is 5 minutes of plank or 200 lunges, which are all numbers you may see in other exercise challenges. Most people need something that eases them in more gently, and spreads the exercise out to different body parts. I didn’t mean for this transition to happen quite this smoothly but it is. If you’re not sure where to start or what kind of challenge to do, we created the 10 Weeks to 10 Push-ups Challenge App. I designed the challenge so that it’s easy for you to pick the level of push-up that is the right difficulty for you as well it progresses you along at a pace that I think is manageable for most people, but you can always make it easier or harder as you go, it’s a set program that you can customize to your level. We built it for both Apple iOS and Android, if you’ve been having trouble sticking to a program or doing a challenge maybe this would be a good place to start. Last thing, this is a new app, we’ve only just released it which means we’re looking for feedback to make it better and you get the inside track, you’re on the team, because you heard about it here, you know our email address Contact Us which means you can tell us what you really think about it and we can adjust accordingly. 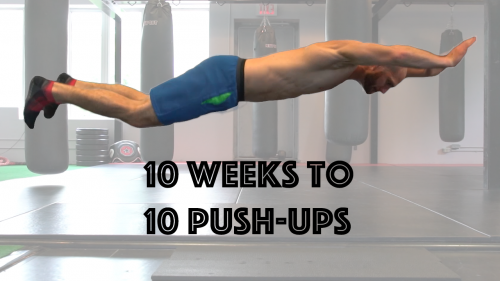 Start the 10 Weeks to 10 Push-ups Fitness Challenge!